Police officers arresting Occupy protesters in Auckland this morning were wearing identical badge numbers, leading to claims from protesters that it was a deliberate attempt to ensure they couldn't be identified. It appears that the police involved have gone about reproducing identification numbers in an attempt to not be identified. Being that the situation was volatile and the likelihood of an assault was high, the police involved have made a conscious decision to break the law to try and avoid potential prosecution for any violent assault they might be involved in. 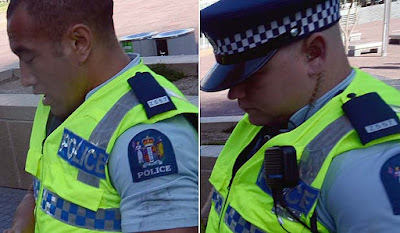 Unlike the situation in most other countries, New Zealand police officers do not have a warrant card which certifies their identity and acts as proof of entitlement to use police powers. Instead, Police staff carry a photo ID card with an employee number, confirming their identity as a member of Police. Constables, Senior Constables, Sergeants and Senior Sergeants also wear an identifying number on their shoulders. At the rank of Inspector upwards, epaulettes do not have 'shoulder numbers', although these senior officers normally wear name badges. As for detectives, by and large such officers do not wear uniforms or badges of rank, but they do have equivalent ranks to uniformed members of Police. When plainclothes detectives wish (or are legally required) to be identified, they simply display their Police photo IDs. It would have been bad enough if the police involved had just removed their numbers like they often did during the Springbok tour protests, but to falsify identification is a very concerning development. Taking on the false identity of a police officer is a criminal offence that is just as applicable to a police officer impersonating another officer as it is to anybody trying to impersonate a police officer. The law makes no distinction to allow the Police to impersonate each other. The [Police] Commissioner must prescribe a code of conduct for Police employees, stating the standards of behaviour expected from Police employees. Well that would be fine and dandy if the Police code of conduct (PDF) wasn't such a shallow and ineffective piece of claptrap that isn't worth the paper it's printed on. It basically says that in providing policing services Police are required to act professionally, ethically, and with integrity. Clearly the officer's involved have acted in breach of their code of conduct... but somehow I doubt the offenders will even be questioned. Who's wrong in the Ports of Auckland dispute? Will John Key Profit From NZ Foreign Debt?